Don’t know what iconic food you should try while you are here? If you have already arrived in Australia, you should already be aware that Australians love their food. Our nation’s multiculturality has blessed us with a huge variety of food that we can pig out on whenever we please. However, if you wish to try some Australian classic cuisine, you may become lost in our diverse culinary offering and not know where to look. In this article, we suggest some food that you may or may not have heard of but will nevertheless enrich your culinary experience in Australia! A traditional biscuit that originated from World War I times. Apparently, wives sent these sweet treats to the soldiers because they transported well. Food had be kept for a long time while they were being transported through the sea. They are made of a delicious coconut and rolled oats base, which is brought, together with syrup. It is undeniably crumbly and crispy with a sweetness that you will not forget! Arguably one of the most Australian fishes you can get. You can get them grilled, deep-fried or pan-fried in many restaurants in Australia and is usually served with fries and a salad! For a healthy Australian meal, think Barramundi! This chocolate bar is usually not on most lists of Australian iconic foods but it should be. Cherry Ripe was created by in Australia and continues to be an all-time favourite here. An Australian chocolate bar which distinguishes from others based on its coconut and cherry filling and a dark chocolate coating! It is favourite of mine and is sure to be a crowd pleaser. If you feel like having something sweet and yummy between classes, give a Cherry Ripe a try. What is known as Australian spring roll. They are deep fried and filled with cabbage, barley, carrot, green beans, beef tallow, wheat cereal, celery and onion. This is edible on the move and without plate and cutlery so it is great for those with limited time to have a meal. They can even be found in most fish and chip shops now! Australians have a long-standing coffee culture that is unmatchable elsewhere. Our Australian coffee has also been labelled as the best in the world and why does she think that? According to the article, Starbucks can dominate the coffee industry everywhere else but Australia. They’re many little cafes around each Starbucks that have better tasting coffee than the industry giant, which is where the sales go. We know how good coffee tastes, where to get it and how to make it. A traditional soda bread made by swagmen and drovers in the outback. It is still found in stores in modern Australia, thus, it is an important and iconic Australian food. It was traditionally a type of bread – however, it used only water, sugar and flour as their ingredients so it was very easy to make and keep. Australian variation of a chinese dim sum. It is a like a dumpling and made of pork or lamb, cabbage and covered in a wrapping. They may be found in most fish and chip stores – steamed or deep-fried and some milk bars. They can serve as an appetiser or have a few and have it as your main meal! It is a food that we have had since we were children. It is a MUST-HAVE at children’s parties due to its sweetness, deliciousness and bright colours. It is also very, very easy to make - It is just bread covered in butter and hundred and thousands and cut into triangles! Australia is surrounded by oceans, which are filled with fish! When going to the beach, you should definitely try out the fish and chip stores near it. Chances are, you will taste the freshest and crispiest fish and chips you will ever eat. One of the most popular icecreams in Australia. It has a unique name and a creamy and soft taste with a rich crumble on top that you will not forget! An Iced Vovo is a sweet biscuit topped with fondant, raspberry jam and dessicated coconut. It is a product of Arnott’s Biscuits, which is the largest producer of biscuits in Australia. The love Australians have towards it is evident in the sales boosts it received after after Kevin Rudd, the former Australian prime minister joked that his team should have a strong cup of tea and an iced vovo before going into work after winning the election. Thus, it is undeniable that is a strong iconic Australian food. Kangaroo is a no doubt the symbol of Australia – it is on our currency, the Australian coat of arms, and heavily referenced and used in popular culture – in television, books, souvenirs and more. However, it is also well loved as a food source since pre-colonial times as it is also an animal that rich in vitamins and minerals. If you are in Australia hoping to experience a true Australian lifestyle and want to try Australian cuisine, why not try kangaroo meat? Lamington is an Australian dessert and a famous culinary icon. They are very simple to make yet they taste amazing. They are made of a sponge cake which is coated in chocolate and desiccated coconut or coconut flakes. Some lamingtons have a cream and/or jam filling, but traditionally, they are served without a filling. You will not have any difficulty looking for them. They can be found at almost every bakery or supermarket in Australia will stock them – that’s how popular it is! Meat pie is best served all year round. There is no bad time to eat a hand-sized pie filled with minced meat, gravy and vegetables. They can be found at most bakeries, supermarkets, convenience stores and specialised stores. According to an article in The Age, Four’n Twenty Pie baked 50,000 pies per hour at their Kensington plant in 2003. A neenish tart in Australian sweet biscuit that is filled with cream and sugar, encased in a pastry and covered in icing. It is notable for its pink and brown colouring on the top of the biscuit, which differs from any other biscuit sold in stores. It is usually found at but not limited to parties and gatherings, and is a treasured favourite! 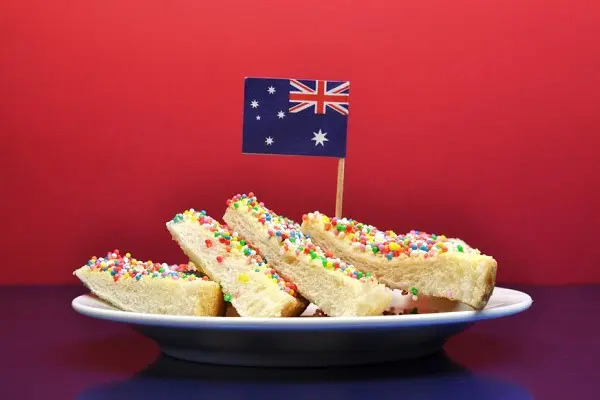 While the origin of the pavlova has been well debated in history, Australians and Kiwis alike cannot deny that it is a longstanding representation of their food culture. Pavlova is a dessert made of meringue and served with fruit on top. It is crispy, sweet and soft at the same time and a must-have at parties and special dinners! 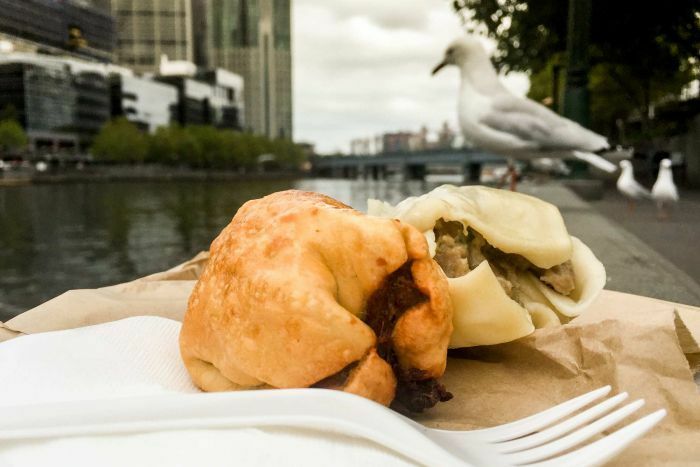 Sausage rolls originated in Britain however they are very important and cherished component of Australian cuisine. It is a pastry wrapped in meat and vegetables that is baked and served with tomato sauce and can be served as party or snack foods along with meat pies. The most delicious biscuit you will ever indulge in in Australia. It is an all-time favourite and it is definitely difficult to stop after eating one. They come in a variety of flavours – original, chewy caramel, white, dark, salted caramel, coconut cream, and more! There will be a perfect variety for you. A very famous breakfast spread that is well known internationally for their bitter taste. Its deliciousness has been well debated over the years – some love it, some hate it! But, it’s a well-known and treasured iconic Australian food that is for sure. It is not a trip to Australia if you do not try it at least once! Try it with bread and butter, avocado and butter, or however you wish. If you dare, even try it alone, straight from the jar! For those who want a different experience, why not try some traditional Aboriginal bush tucker food. It is a white coloured larvae and is usually cooked and eaten, however, they can be eaten raw. For more information, read this. Weetbix claims itself to be Australia’s favourite breakfast cereal, and we must agree. While it does not look the sweetest or most colourful cereal like the others you may find on the shelf at the supermarket, Weetbix ais nutritious, wholesome and taste amazing when you know how what to put into it. My personal favourite is adding some sugar and slices of banana before drowning it in whole milk. But, you will have to try it out for yourself so you can master your own way to eat it! Now that you have seen the best of what Australia has to offer, what is the first item you would like to try? We would love to hear what you think of our favourite Australian foods. Leave us a comment below or send us a message on Facebook with your experience with Australian food so we can hear your opinion! If you have any questions about this article or living in Australia, please feel free to email us at hello@spiible.com or come to Melbourne hub at Suite 208/480 Collins Street, Melbourne.